Learn how to draw a realistic face in this step-by-step video. Carrie will guide you through several demonstrations of a variety of facial features. After learning how to measure and draw accurate proportions, chapters are broken down into individual features (eyes, nose, mouth, head shapes). You'll finish up with lessons on how to shade and draw hair. 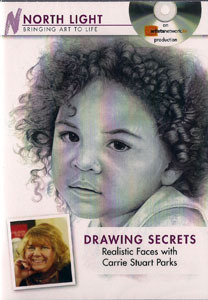 Carrie's friendly instruction and helpful tips will give you the skills you need to draw your own favorite faces.